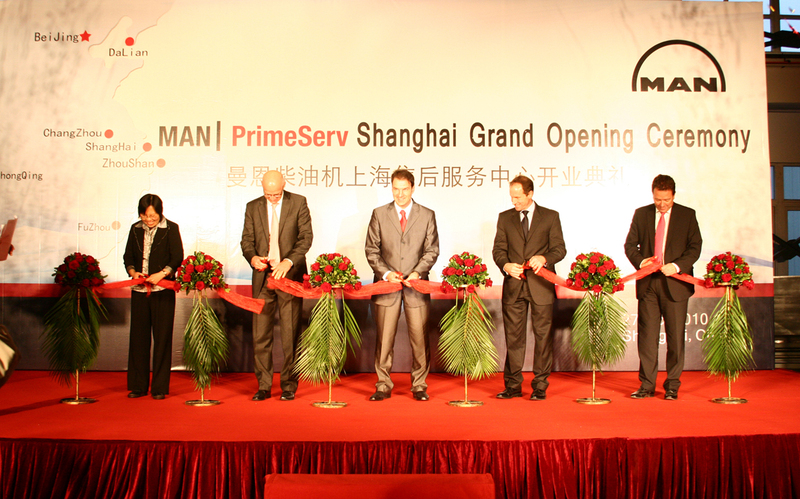 MAN PrimeServ Shanghai has celebrated a move to larger premises in China’s largest city at an opening ceremony attended by business partners, local dignitaries, and Klaus Stahlmann, Jan Gurander and Dr. Stephan Timmermann of MAN Diesel & Turbo’s Executive Board. The move was prompted by a requirement for more operational space due to PrimeServ’s increasing activities locally. The new location at Zhanjiang Hi-Tech Park houses a workshop and warehouse for PrimeServ’s technical service and spare-parts division, and offices for sales, administration and a PrimeServ training academy. Furthermore, PrimeServ has also a bigger workshop located in Changzhou and offices in Beijing, Dalian, Zhoushan, Fuzhou and Guangzhou. As such, PrimeServ Shanghai offers a complete technical package from training through commissioning to spare parts and technical service. Shanghai also offers MAN PrimeServ’s successful Pit Stop concept where PrimeServ ships containerised spare-part kits to simplify maintenance procedures. At the opening ceremony, Dr. Timmermann commented on Shanghai’s strong progress since its inception and compared the 13 employees it had on its books in 2003 with the 80 it currently has. He described the inauguration as the latest step in a long list of investments MAN Diesel & Turbo has made in China and declared the company committed to provide excellent service for international as well as domestic shipping in China. Shanghai’s technical service offers a full after-sales and spare-parts service to customers while the PrimeServ Academy is part of a fully integrated training network and is responsible for all technical training within China, both for MAN Diesel & Turbo personnel and the staff of its business partners. The entire complex totals over 2,000 square metres with the PrimeServ workshop in particular significantly larger than before and benefitting from investment in new machinery, while a whole team of four-stroke commissioning engineers has recently been employed. The Zhangjiang location is also outside the local free-trade zone which, in practice, means less delay in shifting equipment and processing orders, and less paperwork.